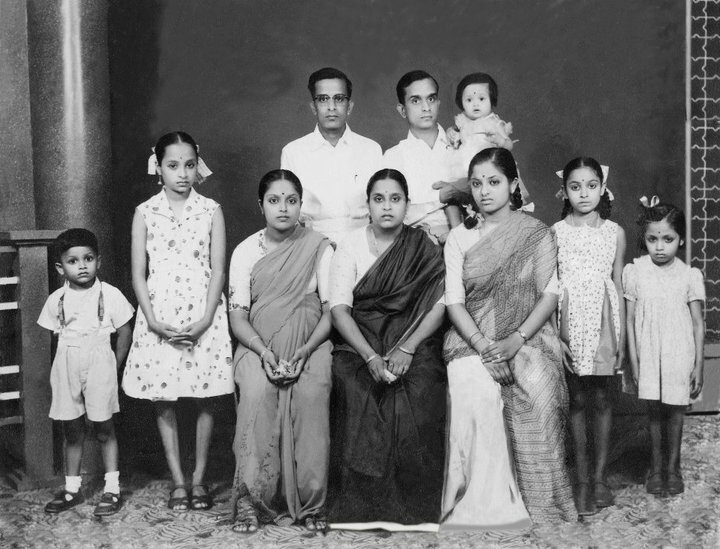 Raman Family in Singapore, 1957.This is a portrait of the Raman family taken in a studio in Singapore in 1957. Seated at the centre is Lakshmi Raman, my mother, who was about 33 years old at that time. In the photo, we have her children (from left to right): Balu (sixth oldest), Vimala (third oldest), Leela (oldest), Lakshmi Raman, Kamala (second oldest), Savithri (fourth oldest), and Chandra (fifth oldest). Standing behind are Lakshmi's brothers, Venkateswaran and Krishnan. Krishnan is holding the baby, Geetha, who is Leela and Krishnan's oldest child, and the first grandchild of Lakshmi and her husband, P. K. Raman. According to the customs of Palghat Brahmins, it was permissible for a daughter (Leela) to marry her mother's brother (Krishnan). The two married women (Lakshmi and Leela) are wearing traditional sarees, while Kamala is in a half saree, generally worn by South Indian girls when they attain puberty. With the help of his brothers-in-law, Venkateswaran and Krishnan, P. K. Raman was running Raman & Co., a company that sold printers and printing ink in Singapore and Malaysia. In 1957, he left the business to Krishnan and migrated to Madras, India to start his new company, Southern Shipping Corporation, Pvt. Ltd. I am the youngest child of the family, born in Madras after the business was well established and the family had settled in the first house they built in the city.